Penelope Thompson is an Australian contemporary artist working internationally. Her work includes outdoor and indoor installation art , performance art , and interactive community art events. 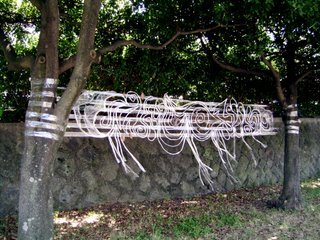 In August 2006, the artist was invited to Jeju Island, Korea to take part in the Jeju Installation Art Festival (JIAF 2006). 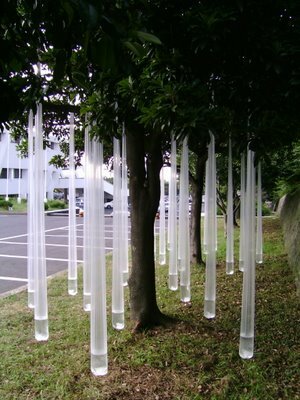 The venue was parkland in Jeju City, and the invited international artists were asked to construct outdoor installation artworks to suit the environment. Penelope created two large works to be suspended from trees in the parkland - "Dreamweaver" and "Raintrees". Both of these works utilised a man-made material (clear plastic) in combination with the natural organic forms of nature. The basic materials used for "Dreamweaver" were sellotape and plastic foodwrap, plus a few fallen leaves and a bird's nest found on the grass beneath the trees. The artist wanted to make a really ephemeral looking piece to express the idea of images in the mind's eye. In effect she was drawing or weaving with the plastic wrap on a background of sellotape, and the shadows made by the afternoon sun added a third dimension to the work. "Images constantly flow and change - a bird, a cloud, the wind, a fish are all connected. Dreams and reality are all the same in the mind's eye." Penelope Thompson - artist's statement for 'Dreamweaver'. In "Raintrees" - the artist wanted to express the feeling of the heavy, cool raindrops of the summer rainy season in Korea. The materials used were clear plastic tubing, partially filled with water and air. These giant raindrops were tied to the branches of trees, and suspended a few inches above the ground. The audience could walk under the trees between the raindrops swaying in the breeze. This installation remained hanging in the trees of the park for two weeks. Outdoor art and performance, "The Elements #1", Korea 2006. Blog entry - "Goryeong International performance Art Festival, The Elements, 2006"
Outdoor art and performance "The Elements #2", Oct 20, 2007: Blog entry - ""The Elements #2",Goryeong International performance Art Festival, 2007"
The true mystery of the world is the visible, not the invisible. Oscar Wilde.